For some kids the idea of sleeping in a dark room is beyond scary. A night light is a great way to reassure your kids that they are safe and budding paleontologist will love these friendly dino night lights. 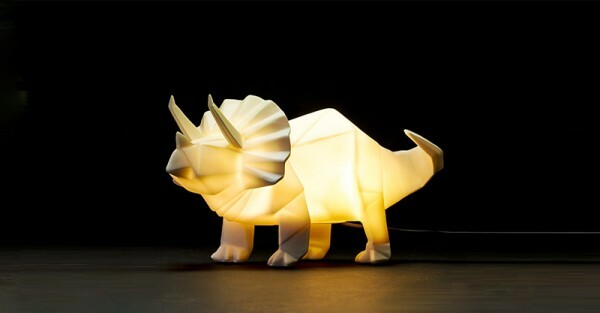 Light up your little babe’s room with a unique origami- style, Dino Lamp from Firebox. Let them choose from one of the three friendly prehistoric dinosaurs to protect them through the night, a tough looking T-Rex, a long necked Diplodocus or my personal favourite, the plant eating Triceratops. Each lamp contains an energy efficient LED bulb that will probably last until the next mass extinction. Made from robust polyresin and available in beautiful, bold, block colours, the lamps are priced at £29.99. You can find them online at Firebox.